Many companies can sell you toner, gloves, and paper rolls. But few can deliver Reliability. That seems to be a forgotten word these days, but Reliability is our commitment to you. We don’t stop there. 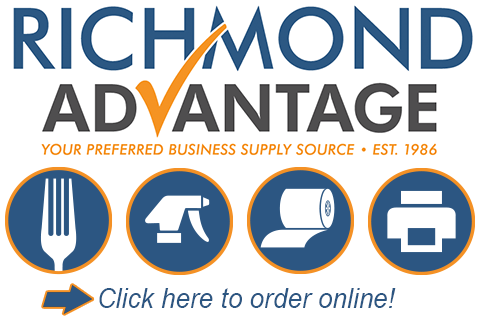 While there are many places to buy supplies and some that have reputations for reliability, only one can offer you the Richmond Advantage! IS A PRIVLEDGE WE TAKE SERIOUSLY. With over 1,000 popular items in stock and access to over 100,000 more, Richmond Advantage is big enough to help you grow and small enough to cater to your specific needs. Others expect you to purchase from what they have, but we partner with you to source the products you actually need. Your account rep works with you to figure out your needs and makes sure you get your order on time and on budget. For over 30 years, you've known Richmond Paper & Ink as a home-grown, family-owned supply company that cares deeply about customers and about community. In that time, we've focused on customer needs and adapting to changing times, all while understanding the values Texas businesses are looking for. Little did we know, that after three decades of serving others, the advantages we've provided would result in a name change. OUR VALUED CLIENTS, RICHMOND ADVANTAGE. More than just a name change. With the new name, comes a new disposition. A willingness to go even further to serve you. We've learned a lot of the years and while trends and preferences have changed, Texas friendliness and following through on commitments are values that just don't change with time. GET STARTED BY CALLING (210) 650-9500.